One Stop Handling Irl. are delighted to introduce this completely new Fully Powered Sprint Order Picker, Simple safety and versatility for high level performance in every sector! This new model was created out of a specific need of several clients, who for some time have used the semi electric model for picking operations. They wanted to see all the details of the model they already loved, transformed into a machine more adapted to their needs. EFFICENCY, SAVINGS, PRODUCTIVITY: today all these have a new name: Sprint! Sprint is the ideal solution for those who want to take the most advantage of space and increase profits. To avoid problems in recovering goods from too high shelving, most stores, supermarkets or warehouses store their goods in shelves no higher than three metres. Using Sprint is a savings opportunity because it allows the amount of articles on display or on deposit to be increased without increasing the floor surface of the building and the related costs. Major productivity and reduction of labour costs for a truly competitive company! Compared to traditional methods, such as the ladders normally used for this activity, Sprint makes the work capable of double the production, in total safety and maximum comfort. The operator doesn’t waste precious energy climbing up ladders or shifting often very heavy packs by hand. Working while producing more with less physical effort is another incentive for working more! Sprint moves quickly and lifts operators and materials, positioning them to the desired height. The innovative loading platform can carry up to 90 Kg and is adjusted electrically by simply pressing a button on the machine. Once the packs are positioned on the Sprint, the operator is not obligated to dismount, push the ladder or move on foot. Furthermore, more material can be loaded on the platform in the front, up to a maximum of 113 Kg, keeping having to go back and forth across the interior of the warehouses to a minimum. 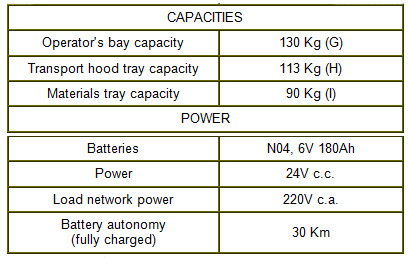 With a full load the Sprint battery can move for 28 Km! Maximum Effectiveness, Minimum Space taking! The innovative driving system of the Sprint model allows for a complete rotation on its own axis, making it possible to use the machine also in very tight spaces. With just 80 cm width and 156 cm length, and a steering range of only …, Sprint is the ideal solution for those who want to take the most advantage of warehouse, supermarket and production unit space. One person instead of two! Safety regulations are clear about the matter of the manual moving of loads. The European Agency for Safety and Health at Work considers a load 25-30Kg as potentially too heavy for most people to lift (Osha Fact Sheet 73). It is thus easy to imagine how high the risks are if the load is not just moved but has to be carried up a ladder by hand. With traditional methods, therefore, the job must be done by two people, but the risks of injury connected to the transport and to the falling of the material are not lessened. • Assuming risky, painful or tiring postures to recover objects which are difficult to reach and often too heavy. • Loss of balance, slipping, objects falling from overhead. 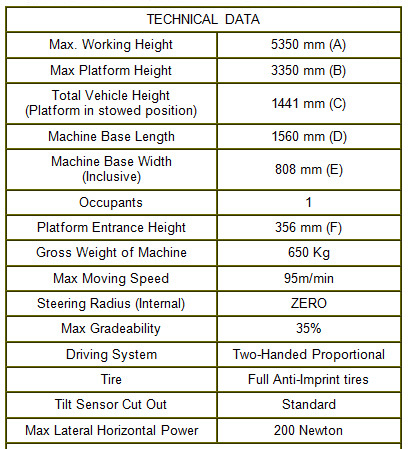 • Loading platform at maximum height corresponds to the column. It is very easy to place even heavy packs, using the column as the setting base and letting it slide up to the material tray. • On the raising platform there are two pedal operated allowance switches, activated with the heels, which guarantee the stable position of the operator without limiting comfort. • By removing one foot from the two switches, all the operating functions for raising/lowering the machine are automatically disabled. • The left hand has to be positioned on the handle, in front of the sensor, to allow activation of the shifting/raising/lowering of the machine. • All the functions are useable without having to move the hand from the accelerator, for maximum operator comfort. • Acceleration of forward/backward movement is proportional and positioned near the basket raising and lowering button, to enable these movements even during forward movement. • Buttons to regulate the height of the loading platform at thumb’s reach! The ground control panel is a highly technological device, equipped with an efficient system of automatic diagnostic control, which can detect any anomaly or malfunction happening on the vehicle. Errors can be caused by a malfunctioning of the machine or by a condition in the work area. Usually the operator can correct these breakdowns, without having to have the machine repaired by a qualified mechanic. • Innovative lifting system without chains or lubricants! • The revolutionary raising system is a radical change in the sector. • The column in special extruded aluminium alloy is completely without any type of maintenance. • No maintenance required – the raising system is guaranteed for 10 years!